We believe art is a fundamental and natural part of the human experience, that all children have a natural curiosity and instinct for creative expression, and that art is an experience to be lived and shared. 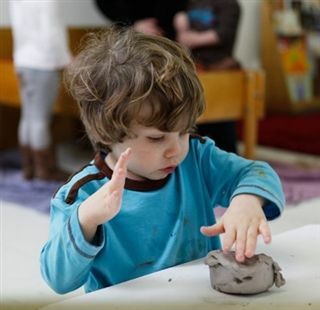 The children at City and Country "make art" rather than "do projects," and the process of using art materials is the focus of the Art Program. Art is a daily activity in the Lower School classrooms, where children have access to paint, clay, paper, collage, and drawing materials. They become familiar with the properties of these materials while they experiment and work. In the 6s, the children begin to go to the Art Room each week. They already have substantial experience in the creative process and are eager to learn about the new materials and techniques that await them. Clay and paint remain the basic materials used by the older children, with new media introduced as the children are ready. These include linoleum blocks, scratchboards, collage materials of all sorts, plaster, metal, chalks, inks, charcoal, precision drawing implements, watercolors, and 3D printing. As a Special, Art is integrated with the social studies and Jobs Programs for all Middle and Upper School Groups, providing a wealth of artistic possibilities as children explore different cultures and time periods. Students’ exploration of Lenape pottery, ancient Near Eastern cylinder seals, and oil paintings from the Renaissance, for example, provoke discussion about the cultural forces that spawned these forms and experimentation with the artistic techniques involved. Following historic developments, children are introduced to an increasing number of materials, tools, and techniques. For example, they will learn about the beginnings of American landscape painting in the 10s and examine the history of protest art in the 13s, as they study 20th century American and global history and undertake their Job as the School’s journalists. Throughout their years at City and Country, personal expression is encouraged as it develops alongside the children’s Group explorations. Electives and our Afterschool Program provide additional opportunities to Middle and Upper School students to continue working on an art piece begun during the regular school day, or to try out a new art medium.